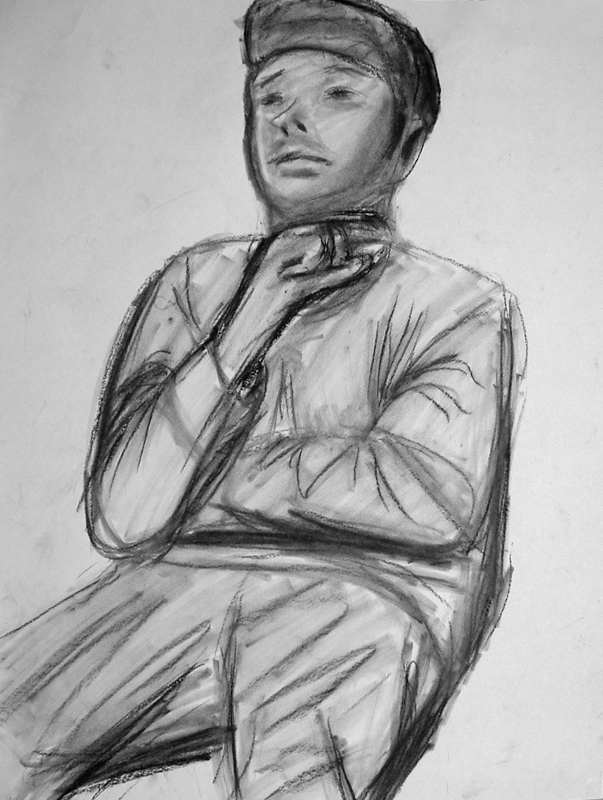 Part of Drawing Fundaments Final Portfolio - Portraits. 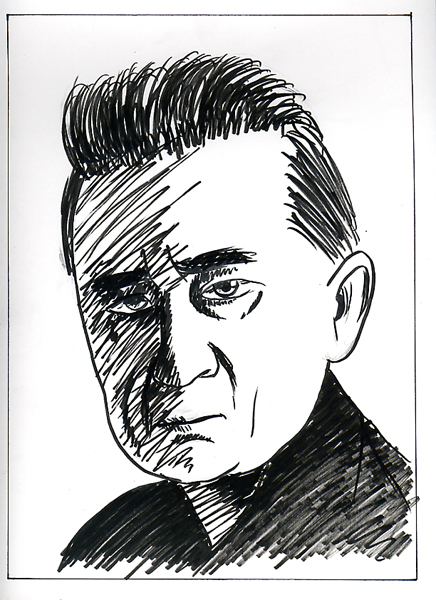 This pic of Johnny Cash was probably the one the teacher liked the best, though I don't think it's one of my bests. 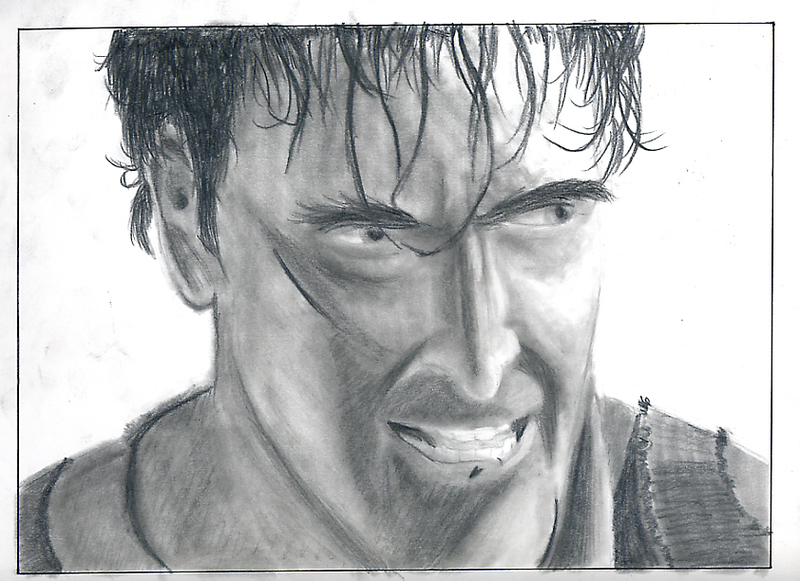 Again, I don't think I got the likeness quite right, but that is mostly just time restraints I guess. Part of Drawing Fundaments Final Portfolio - Portraits. Part of Drawing Fundaments Final Portfolio - Portraits. It's Bruce "Jesus Motherf*cking Christ" Campbell!!!! My buddy was able to recognize this, though I don't think I quite got him likeness fully. 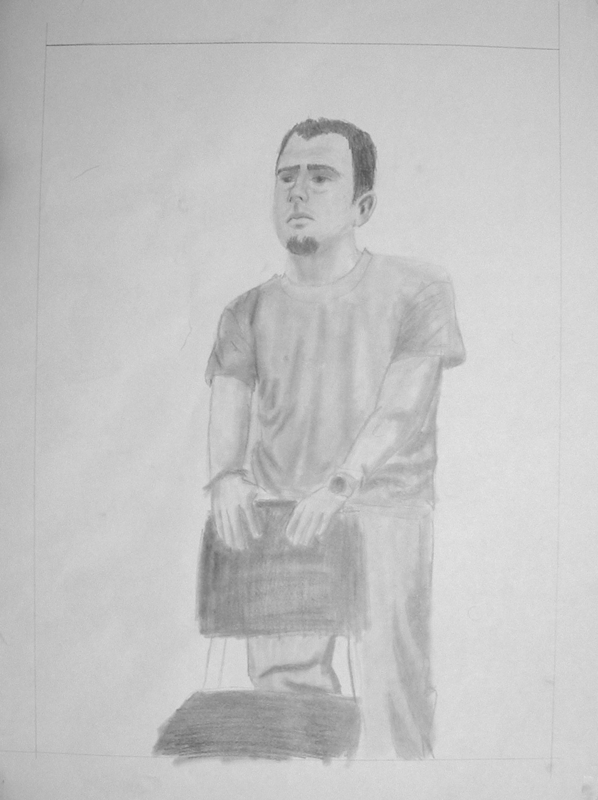 Part of Drawing Fundaments Final Portfolio - Portrait. This, if I had alittle more time to work on it, would have been alot of fun and been probably the best part of my portfolio. 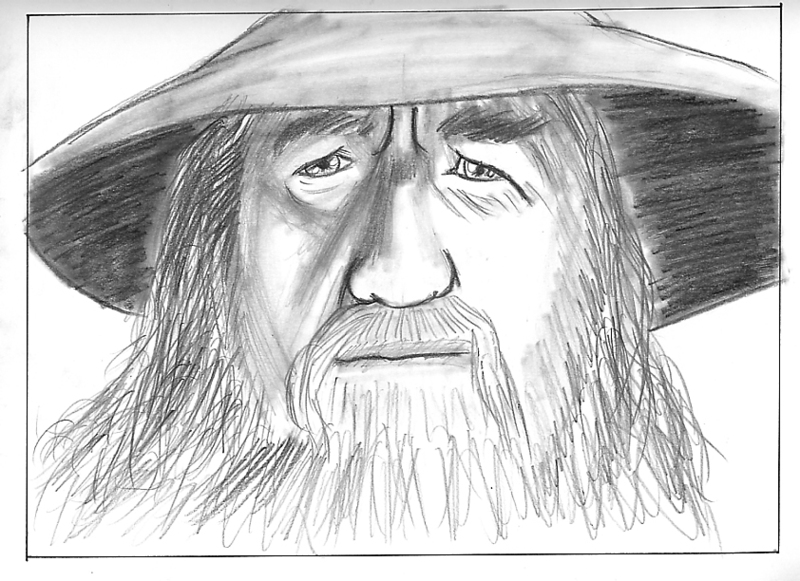 I when working on portraits I really like to part ALOT of work in it, not just like a half hour or something(as before mentioned, Modern Willie took 20 hrs), though I am dissappointed that I didn't get to spend as much time on these as I really wanted to, some of these sketches did turn out ok. Of course Gandalf the Gray had to be one of my portraits. 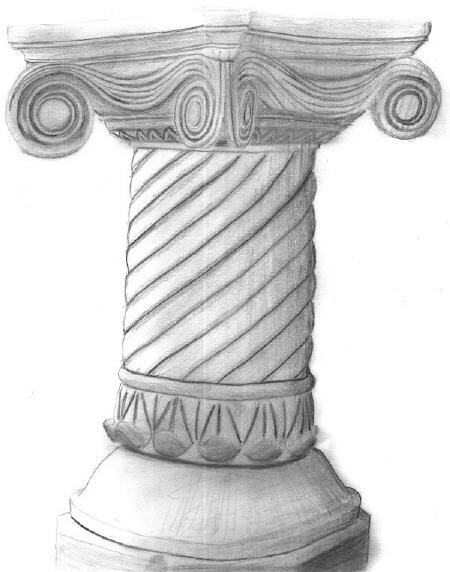 Part of Drawing Fundaments Final Portfolio - Reproduce another work of art in different media. 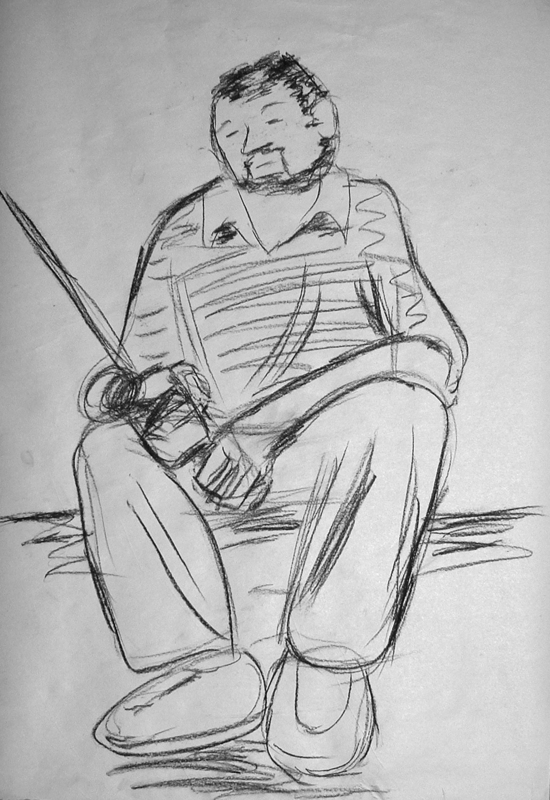 Picasso - The Old Guitarist. This painting always had an appeal to me. 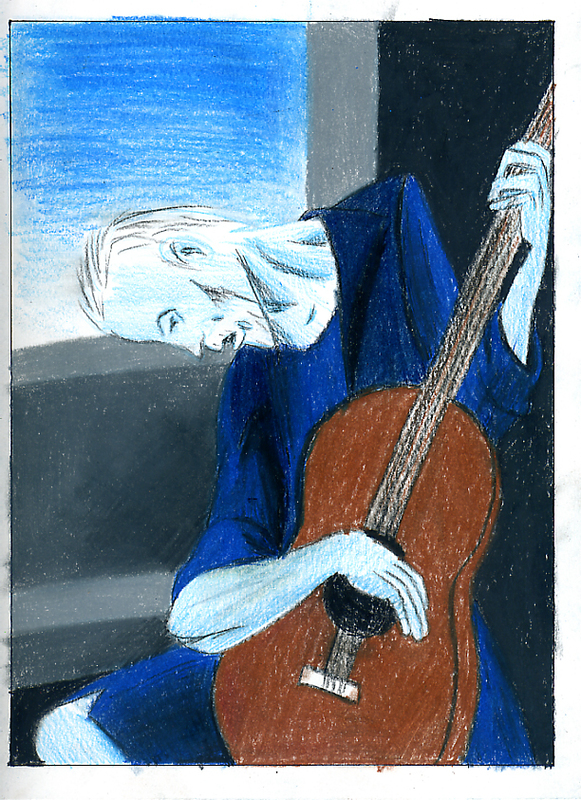 Picasso - The Old Guitarist. 2nd reproduction. Part of Drawing Fundaments Final Portfolio. 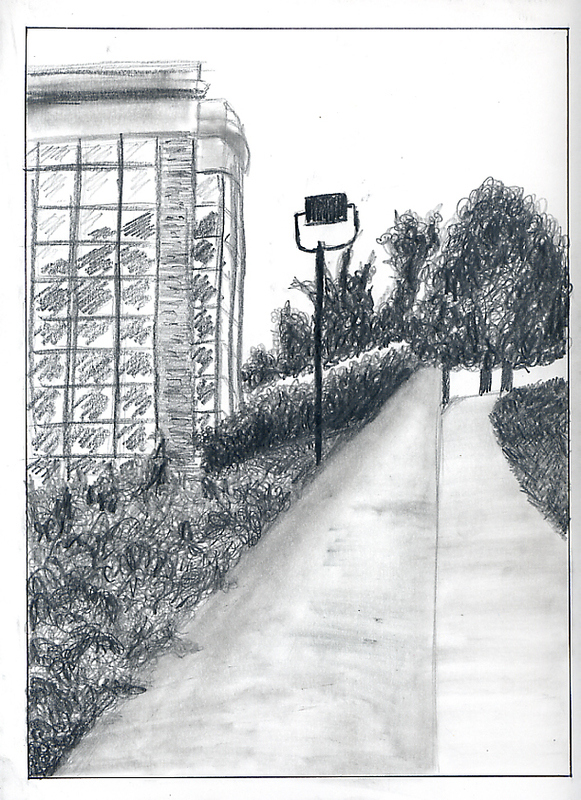 The assignment was to draw 10 thumbnail sketches of various landscapes, and from those thumbnails, create a fullsize horizontal and vertical piece. Spliced the 2 pages together so they can be compared. Part of Drawing Fundaments Final Portfolio. My vertical landscape. Rear of Sherrod Library at ETSU. Part of Drawing Fundaments Final Portfolio. My horizontal landscape. 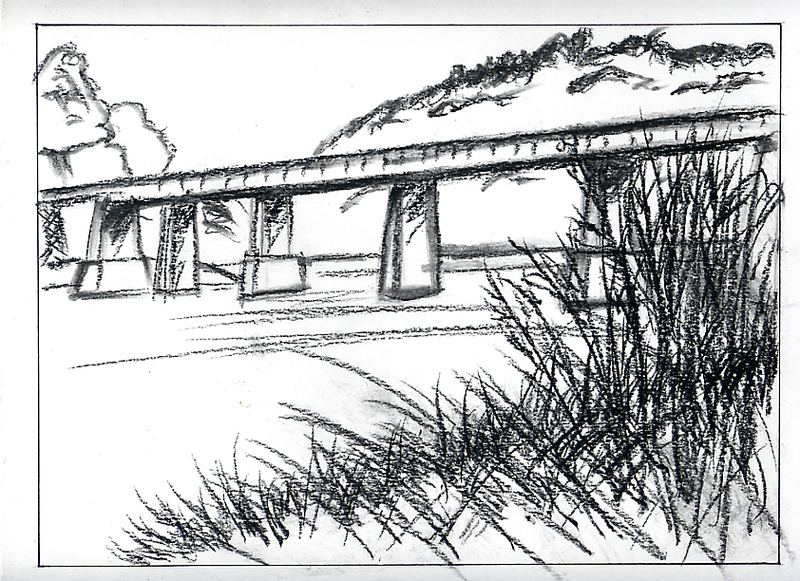 Bluff City Train Bridge. Part of Drawing Fundaments Final Portfolio. 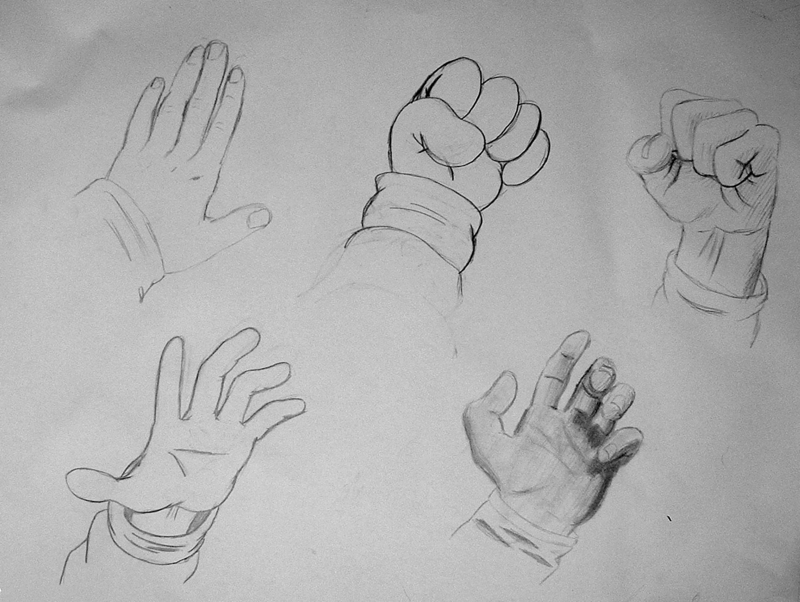 The assignment was to draw my hand from 5 different angles, so I decided while I was at it to draw each in different media as well. Spliced the 5 pics together so they can be compared. Part of Drawing Fundaments Final Portfolio. This project consisted of drawing the same tree in 5 different media. I decided to use a weeping willow outside the Culp Centre back at ETSU. Spliced the 5 pics together so they can be compared. Part of Drawing Fundaments Final Portfolio. The assignment was to draw 5 blind contour drawings. Try to guess all 5, all of which are objects you'd find in my room. Spliced the 5 pics together so they can be compared. Alot of difference 5 mins makes. I still had a problem getting the face to look like the model, though it looks fine on it's own I guess. Antone's hat threw me slightly at the angle was at. I offered him mine, but after toying with the idea he said he couldn't pull it off like I do. LOL, well I guess I shouldn't argue with him. Teacher: I see we finally got Justin to loosen up a bit. Teacher pauses, and procedes to walk away. I think i need to work alittle on freehanding faces and maintaining likeness, I've seemed to have had a problem with making faces look like the actual person when I freehand verses when I've grided from a photo. Not to mention my teacher's had a problem with me using ANY for of mathmatical determination of drawing anything, be it simple geometry or whatever. (He's threatened to take my ruler)Something tells me he has a problem with draftsmen. I could always use more practice on the technical stuff like this, I very much want to get down a better understanding of anatomy. Now as you may notice, each of thes hands aren't exactly...uniform. There's a good reason for that. 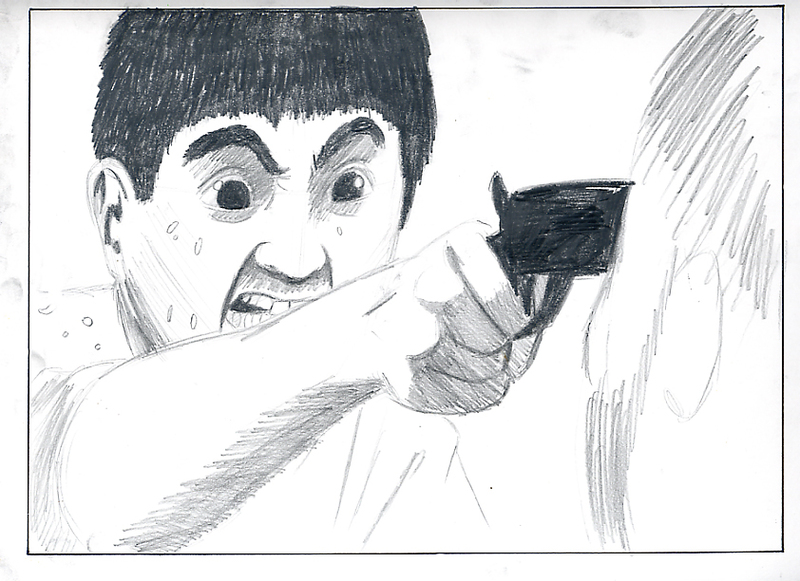 My teacher lately has been making slight comments and subtle cracks at my style being....too photorealistic.....(suppresses laughing) So, just to let him know I'm not so 1 dimensional, I tried to throw a range of techniques on top of different hand postions in this exercise, hence the the odd cartoon hand in the center. looking back I wish I threw an abstract charcoal hand in there while I was at it, but I think I got my point across. XP. 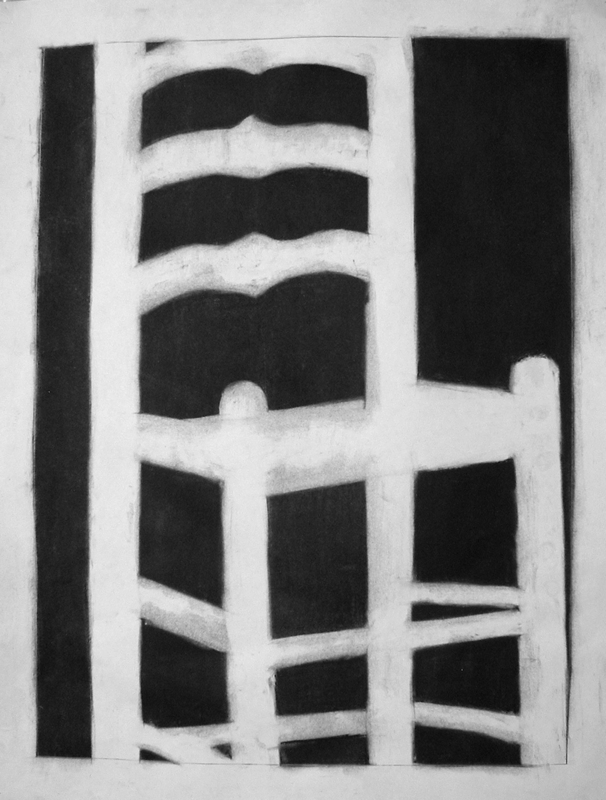 Nothing too special here, most everyone has done the basic still-life with the same basic shapes 20 times over in school. So I decided to try getting some extra lighting practice in here. 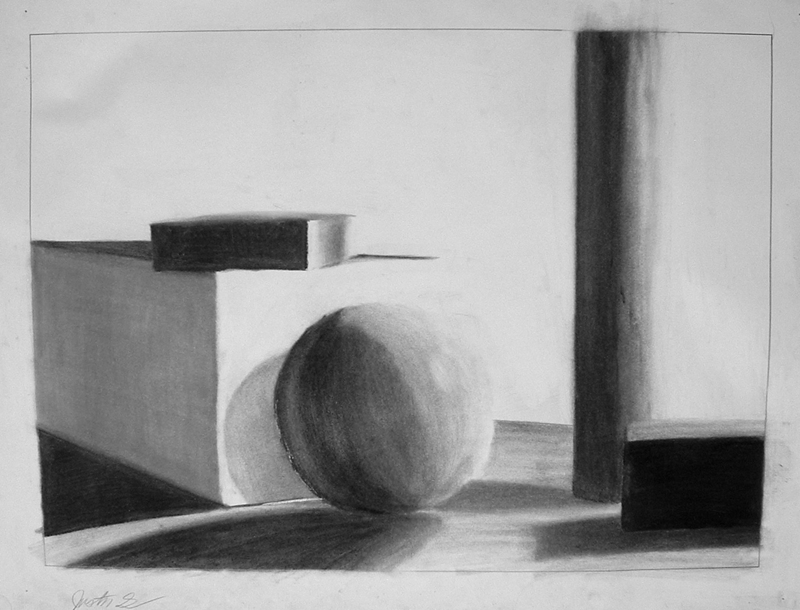 the shadows in the ball and boxes did turn out nice, I probably coulda done alittle better with the cylinder, but I really haven't gone too in depth with pencil, pastel, charcoal in about a year and a half. 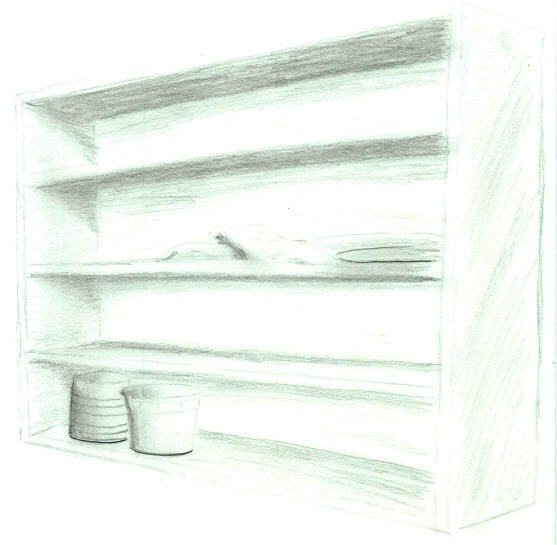 This assignment involved drawing a still-life by filling the negative space only, which does produce an interesting effect. I was actually supposed to make the chair touch at least 3 sides of the border. As I started to finish, I shaved it pretty damn close XP. The only thing I hated was the fact that the Black areas turned out very nice but i stained the whites. LOL well that's charcoal. One of Dad's prizes from one his old hunting adventures. This Elk was freaking huge, the rack alone was 5' wide. 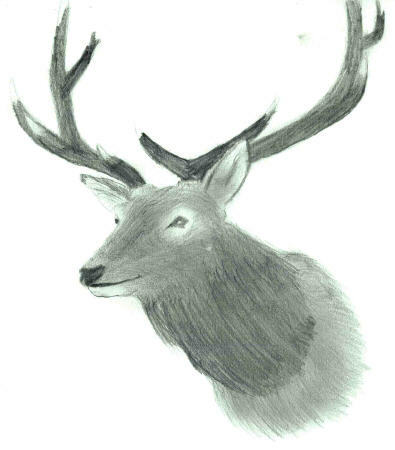 one of my first attempts at fur. 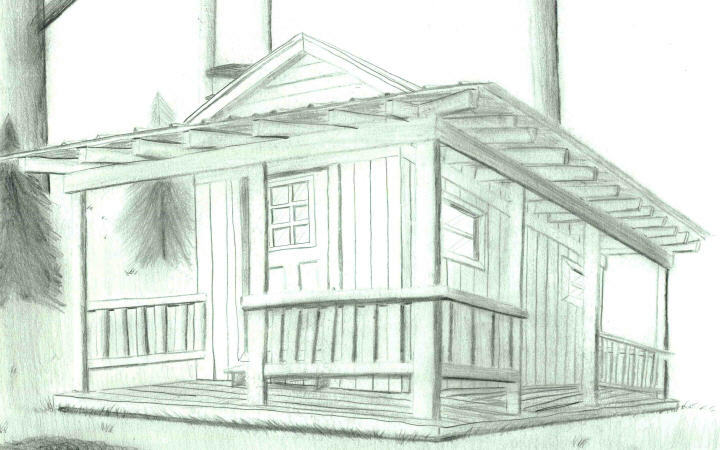 A place very dear to my heart, old cabin I helped build and land is also in my name. Hopefully I'll be able to do abit more with it eventually. More high school busy work. 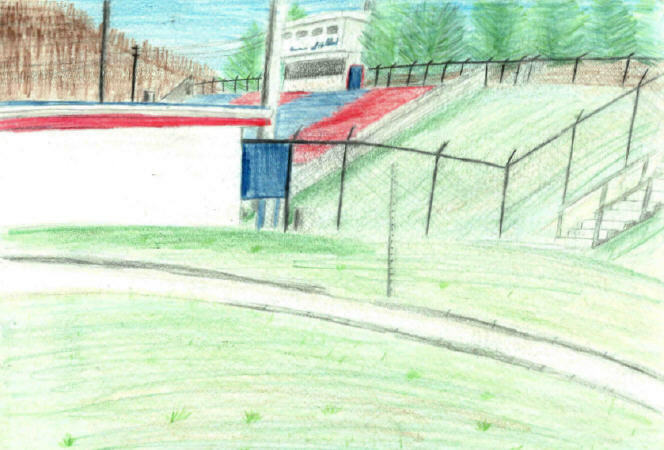 I got REALLY bored in art class, so I sat in the window seal an just drew the football field. 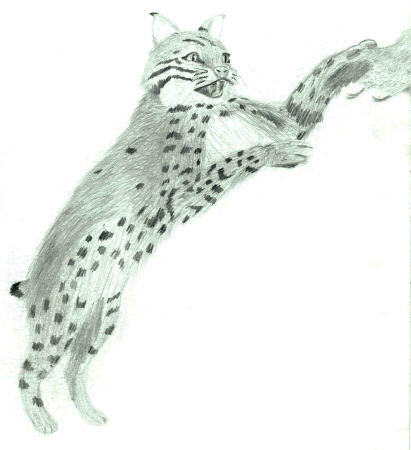 This was one of the really cool things we did in my high school art classes. 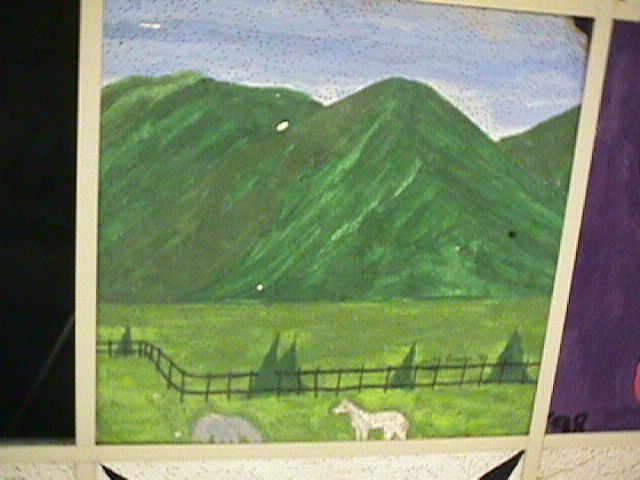 If you got done with your work early (which I did quite often), you got to take down a ceiling tile and paint something on it. I think I did something along the number of 7-9 by the time I graduated. I have a few of these scattered in the various archives.